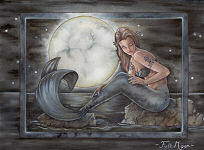 Here are a few pictures of Colored Pencil Fantasy Artist Marjolein Gulinski. She lives in Holland and is 22 years old. "I love drawing fantasy art because I feel that the idea is so happy and uplifting that it can bring light into anyone's world "
It's her lifelong dream to sell fantasy pictures all over the world and maybe to make a real career with it! So this is a really big step to be on the Fairies World site for her! She adores the art Of Amy Brown, Jessica Galbreth and many more fantastic artists around the world!! "I hope you will enjoy my paintings and drawings as much as I enjoyed making them." Marjolein Gulinski will appear in the new book "500 Faery Motifs"
Her mask is made with gold paint, so she's really shining, and glittering!! Aurelia really means gold in Latin. Also a cute little fairy. She's sitting in the new spring blossom that smells really sweet and lightning up her whole day. That's what the Blossom Fairy like the most. Erlina is a Celtic Fairy. That's why I added celtic knots around her. She really is a Irish girl because of the red hair and freckles! Please don't forget her, she really would like to see you again and will tell you all her secrets. So please believe in her and you will see her again.